← Someone Else’s Courtroom: How Exactly Did I Get Here? A close friend and mentor of mine taught me this cute little phrase: “Go lick a shut-up-sicle!” Now, I realize that can be offensive, so I try not to say that to people, and if you’re offended by “shut up” in any context, maybe it’s best you stop reading. But I do believe there is a place for this little phrase, and I’ve more or less come to adore it. Even around my Moms’ Prayer table every other week, we’ve come to have more than one giggle about it. You’re not worthy because you can’t offer your children $800/week stimulating, science camps all summer. You’ve already failed to give them the edge. They’ll never have the skills for scholarships now. You’ve caused them to fall behind their peers. Great parent you are! You’re not worthy because you don’t school at home, raise chickens, grow your own vegetables, and make bread from scratch every day. You’re not worthy because you are a bad person for living away from family. It doesn’t matter that a job brought you to where you are. You left the flock, so shame on you! You deserve not having any help. You’re not worthy because you can’t keep a clean house or ever get anywhere on time. Why would anyone want to come over to your cluttered, small house anyway? 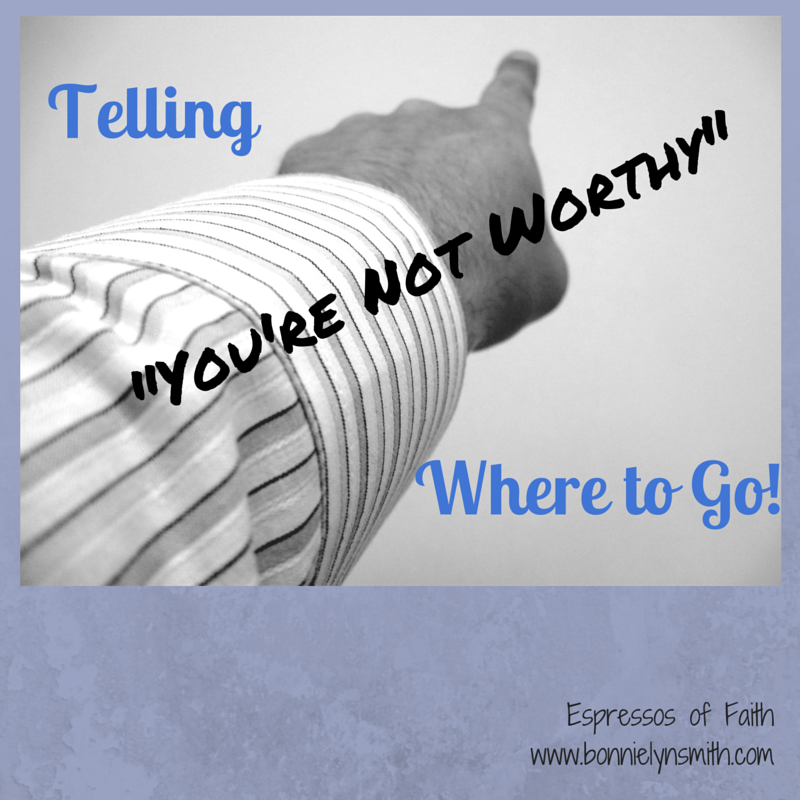 You’re not worthy because you don’t bring in a regular paycheck and/or you stay at home. You’re not worthy because your social anxiety makes you awkward. Your direct approach makes indirect folks cringe, and you should never make other people uncomfortable because of who you are. Much of the time these thoughts aren’t actually spoken to us. Some of them fall under that slippery slope of dangers of comparing ourselves to others. Regardless of cause, they are dark voices inside our own heads. They may be informed by pieces of what has been said to us over time or even our own insecurities, but they are absolutely 100 percent lies the enemy of our soul offers to keep our focus off not only our Creator but also helping other people. At first, these voices of condemnation wink at us, flirt with us, court us, buy us a nice new dress, and take us for a charming waltz across the floor—far from the things we should be focusing on. Pretty soon we are getting in the car with them and going for a long drive. But that’s where the shut-up-sicle comes in. Oh, how I love that shut-up-sicle! See, the thing is: We don’t have to listen. We can tell “You’re not worthy” to be quiet! We have power and authority to shout it out with the name of Jesus—because that name makes that condemning voice quake, tremble, and run back into the dark corners from which it came. The Bible says we are worthy because Christ died for us. That more or less shouts out any and all voices that say otherwise. For while we were still weak, at the right time Christ died for the ungodly. For one will scarcely die for a righteous person–though perhaps for a good person one would dare even to die–but God shows his love for us in that while we were still sinners, Christ died for us (emphasis mine). There is therefore now no condemnation for those who are in Christ Jesus. For the law of the Spirit of life has set you free in Christ Jesus from the law of sin and death. For God has done what the law, weakened by the flesh, could not do. By sending his own Son in the likeness of sinful flesh and for sin, he condemned sin in the flesh, in order that the righteous requirement of the law might be fulfilled in us, who walk not according to the flesh but according to the Spirit (emphasis mine). I have learned over time to call “You’re not worthy” by name. I don’t bother to fight with that nasty voice “You’re not worthy.” That battle has already been won. End of story. It is finished (John 19:30). **It can also be found at Mom 2 Mom Monday Link-Up #25, Grace & Truth Link-Up, and Simply Inspired Wednesdays. 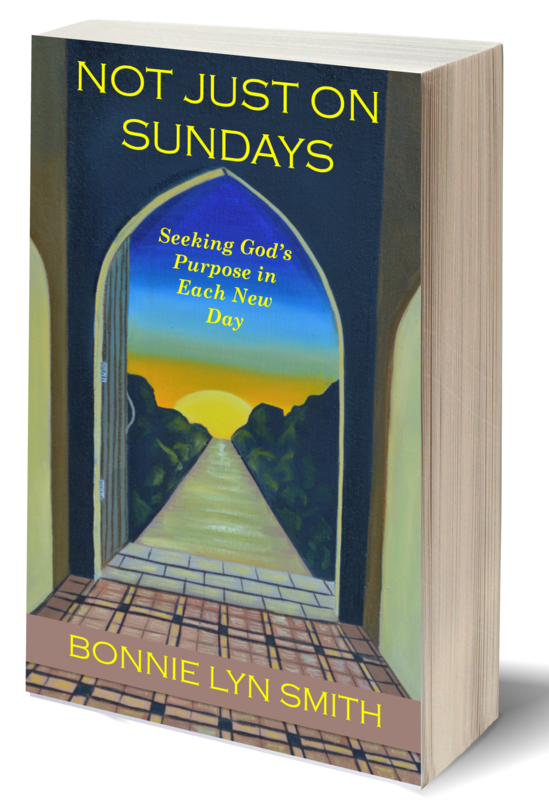 More on grace, relationship with God, and renewing our minds can be found in Not Just on Sundays: Seeking God’s Purpose in Each New Day. I love that phrase! We were just talking about this in my lifegroup yesterday. The devil knows he can’t take away our salvation so instead he just renders us ineffective by trying to fill our heads with lies. And we often don’t realize that’s what’s going on until we’ve been sidelined for weeks, months or even years. You are so right that the enemy does that to us! And it can sometimes be a while before we dig ourselves out. I am trying to see these red flags sooner than I did before as I mature, but occasionally I really do befriend the lies for a while. Until I find myself further from God. Slow learner sometimes. Love, love, love. I have so often allowed myself to put myself down thinking I’m not worthy because of basically all the reasons that you have listed. But at the end of the day, I just remind myself, No, I”m not worthy, but God loves me anyway. Loves me enough to send his son for me. So even, if I’m not worthy, I am very loved! This is great. I do tend to get in a rut sometimes and believe the lies, it takes me awhile to rememeber I can tell them to shut up! Isn’t that so empowering, KC? I sometimes forget the amazing power of the name of Jesus. Thank you for reading! Love it – we are “worthy” in the Lord! Great reminder! Thanks for stopping by, Clare! Thank you for the encouragement! Amen! We don’t have to listen to that voice, thanks to the freedom Christ’s shed blood purchased for us. I’m glad you shared this with us at Grace & Truth. Thanks for coming by, Jennifer! I’m really enjoying Grace & Truth! Such variety! And yes, sometimes I need the reminder that listening to that voice is optional. It’s so nice to turn it right off by the power of Christ’s name. I’m not offended! I think this is one time where saying shut up and talking back is absolutely appropriate! Thanks for reminding me to listen to the negative talk that can go on in my head! Thanks, Amy, for stopping by “Espressos of Faith!” I’m so glad you agree! Negative talk is such an everyday downer, it’s time we told it where to go! 🙂 Blessings!